Among the famous men who shaped the destiny of the Indian struggle for freedom, Chittaranjan Das ranks as one of the most outstanding and prominent patriots who sacrificed his all for the country's cause. His countrymen hailed him as a ‘Deshbandhu’ (Friend of the Country) because he declared in 1905: "If I die in this work of winning freedom, I believe I shall be born in this country again and again, live for it, hope for it, work for it with all the energy of my life, with all the love of my nature till I see the fulfilment of my hope and the realisation of this idea". Chittaranjan Das (C R Das) (1870-1925), a landmark figure in the history of India's struggle for freedom, was indeed an 'Apostle of Indian Nationalism'. A political leader, lawyer, poet and journalist, C R Das, was born on November 15, 1870 in Calcutta. He was the eldest son of Bhuban Mohan Das and Nistarini Devi. The Das family was one of the most distinguished and cultured in Bengal and belonged to that sect of reformed Hindus known as the 'Brahmo Samaj'. Bhuban Mohan Das was a solicitor by profession and an amateur journalist and poet. It is not therefore surprising that Chittaranjan Das's journalistic and poetic leanings were inherited from his father. After completing his school education at the London Missionary Society's school at Calcutta, C R Das joined the Presidency College and took the Bachelors Degree from Calcutta University in 1890. Even as a student, C R Das was greatly influenced by the political ideals of Bankim Chandra Chatterjee. In Presidency College, Calcutta, C R Das was a leading figure of the Students Association and from and from Surendranath Banerjee he took his first lessons in public service and elocution. In 1891, he went to England to take the Indian Civil Service Examination and failed to qualify. He joined the Middle Temple to study Law and was called to the Bar in 1892. During his stay in England he made several political speeches, notably in support of the Parliamentary candidature of Dadabhoy Naoroji, the first Indian to be elected to the House of Commons. C R Das returned to India in 1893 and commenced his practice as a Barrister in the High Court of Calcutta. But for many years he had little success. From 1893 to 1906, C R Das and his family went through a period of acute financial trouble. Both C R Das and his father Bhuban Mohan Das were financially ruined and had to seek the relief of the Insolvency Court in 1906. What is amazing is that as soon as his circumstances permitted it, C R Das took the unusual procedure of applying for the annulment of the Insolvency Order and paid back the entire amount of his and his father's debts. The debts had become time barred, but C R Das considered himself under a moral obligation to repay them. This act of exemplary honesty, which has very few parallels in any country, is one of the many instances of the magnanimity and large-heartedness that C R Das showed in all matters connected with money throughout his life. It made a tremendous impression on undivided Bengal and was widely appreciated all over the country. From 1893 to 1906, the chief event of CR Das’s life was his marriage in 1897 to Basanti Devi (1878-1974). She was an extraordinary woman and became a matriarch figure in the freedom movement. Netaji Subhas Chandra Bose regarded her as 'Ma' or 'mother'. CR Das was a distinguished Bengali poet. He established his reputation as a great poet in 1913 after the publication of the first two volumes of his poems 'Malancha' and the 'Mala'. According to many literary critics, CR Das has an abiding place in Bengali literature. In 1913, learning that Sri Aurobindo in self imposed exile in Pondicherry was in dire financial need, Deshbandhu Chittranjan Das offered him Rs. 1000 in exchange for a translation of his Book of Poems called Sagar-Sangit (Sea-Songs). Sri Aurobindo agreed to translate the poems of CR Das into English and completed it in 1913 itself. This English translation of the poems of CR Das along with his other writings was, eventually was published, by Ganesh and Co., Madras, in 1923. As a Lawyer, C R Das first came into prominence in 1908 as Counsel for Defence in the trial of Aurobindo Ghose, the Editor of the 'Bande Mataram'. The partition of Bengal in 1905 had let loose a tremendous wave of nationalist agitation and revolutionary activity and the Government resorted to unusual repressive measures. The Bande Mataram was the foremost nationalist paper of the day, and Aurobindo Ghose was tried on the charge of sedition before the Chief Presidency Magistrate of Calcutta. This was the turning point in his career and this case brought C R Das to the forefront both professionally and politically. Aurobindo Ghose was honourably acquitted. This is how C R Das concluded his defence of Aurobindo in 1909; it was a unique blend of passion and argument and masterly prose: 'Long after this controversy is hushed in silence, long after this turmoil ceases, long after Aurobindo Ghose is dead and gone, he will be looked upon as the poet of patriotism, as the prophet of nationalism and the lover of humanity. Long after the mortal in him has perished, his words will be echoed and re-echoed across distant seas and lands'. Aurobindo Ghose, the Mother, the Aurobindo Ashram and Pondicherry have all become household words and names in all the continents today as rightly prophesied by the supremely clairvoyant Deshbandhu Chittaranjan Das in 1908. The next landmark case which C R Das handled was the Manicktolla Bomb Case, one of the most sensational political trials in modern Indian history. Following a bomb outrage in Muzaffarpur, the police unearthed a bomb factory in Manicktolla, a suburb of Calcutta. 36 Bengali youths, including Aurobindo Ghose and his brother were tried in this case. C R Das endeared himself to the heart of nationalist Bengal. From this time onwards, he became the richest lawyer in India earning a massive amount of more than 50,000 Pounds per year. CR Das came to nationalist politics early in the twentieth century. He was associated with the revolutionary organisations like the Anushilan Samiti. As a co-worker of Surendranath Banerjea (1848-1925), Bipin Chandra Pal (1858-1932) and Aurobindo Ghosh (1872-1950), he utilised the issue of the Partition of Bengal (1905) for expanding the revolutionary activities in Bengal to drive the English out of India. C R Das closely associated himself with the rising tide of new nationalism that was set in motion by the partition of Bengal and with its two new media organs, The New India and Bande Mataram. CR Das also joined the Indian National Congress as a delegate in 1906. He took no active part in politics till 1917, when he was invited to preside over the Bengal Provincial Conference of the Congress Party at Bhawanipur in 1917 in Calcutta. His connection with politics which began in this way continued uninterrupted until his death in 1925. His presidential address before the Bengal Provincial Conference was more in the nature of a sentimental rhapsody than a considered political speech. He painted a highly romantic picture of Bengal's golden past and attributed the present suffering of the people to their fall from the spiritual ideals of ancient India and to their blind adoption of the materialist values of the West. He suggested as remedies, village reconstruction, return to the soil and the renouncing of industrialism. In 1920, at a special session of the Congress held at Calcutta under the Presidency of Lala Lajpat Rai, Mahatma Gandhi announced his famous programme of Non-Cooperation. C R Das proposed some changes in it but in vain. He however had the support of Bipin Chandra Pal, Pundit Madan Mohan Malaviya, Jinnah and Mrs Annie Besant. Three months later, the Congress Party met at Nagpur where C R Das accepted Mahatma Gandhi's leadership and came back to Calcutta to renounce his large practice at the Bar. The whole nation was deeply impressed to see this supreme act of self-sacrifice by C R Das. When the Prince of Wales came to India in 1921, C R Das took an active part in organising agitation and boycott by the Congress volunteers in Calcutta. C R Das was arrested and sentenced to six months imprisonment. After his release in 1922, he was elected President of the Indian National Congress Session at Gaya. Deshbandhu Chitta Ranjan Das was introduced to the delegates at Gaya by Mahatma Gandhi. In his Presidential Address, C R Das declared: “What is freedom? It is impossible to define the term; but one may describe it as that state, that condition, which makes it possible for a nation to realise its own individuality and to evolve its own destiny. The history of mankind is full of stirring stories as to how nations have fought for freedom in order to keep their nationalism and their individuality inviolate and untarnished”. C R Das wanted 'Swaraj' for the masses, not the classes. CR Das, however, strongly criticised the announcement of the suspension of the Non-cooperation Movement by Gandhi in 1922 and condemned it as a serious mistake. In his opinion, this action of Gandhi demoralised the political workers to a great extent. At this critical hour, CR Das came forward with his formula of the Council Entry Programme, or Non-Cooperation from within the Legislative Councils. He was vehemently opposed to the Congress principle of boycotting the Legislatures. He held that entry must be gained into the Legislatures with a view to offering uniform, continuous and consistent obstruction to the government. His proposal of Council-Entry was, however, rejected by the annual session of the Indian National Congress, held at Gaya in December 1922. Thereafter he resigned the Presidentship of the Congress and laid the foundation of the Swarajya Party within the Congress in collaboration with Pandit Motilal Nehru, Hakim Azmal Khan, the Ali brothers and others. In the election to the Bengal Legislative Council, held in 1923, the Swarajya Party of C.R. Das achieved a remarkable victory. Deshabandhu was of the opinion that the obstructionist policy of the Swarajists would not succeed without the wholehearted cooperation of the Muslim members who formed a substantial group in the Bengal Legislative Council. Indeed he was a political realist with deep-rooted convictions and never diverted himself even in the face of the most vigorous opposition. Himself an ardent advocate of Hindu-Muslim unity, he succeeded in resolving the communal problem of Bengal in a memorable way. He won over the Muslims of Bengal to his side through an agreement commonly known as the Bengal Pact. The terms of the agreement were accepted at a meeting of the Swarajya Council Party held on 16 December 1923. Unfortunately the Pact was opposed by many of the Congress leaders of Bengal. Through the efforts of C R Das and the Swarjists, Maulana Abul Kalam Azad was elected President of the Congress Special Session at Delhi in the first half of 1923, where the programme of 'Council entry' recommended by C R Das was approved. This proposal of C R Das was later confirmed at the Cocanada Session of the Indian National Congress held in December, 1923. CR Das was elected the first Mayor of the Calcutta Corporation following the victory of the Swarajists in the election of that organisation in 1924 and was reelected for the next term also. He presided over the All India Trade Union Congress held at Lahore and Calcutta in 1923 and 1924 respectively. He presided over the Bengal Provincial Conference held at Faridpur in 1925. He founded the weekly Forward, the organ of the Swarajya Party in 1923. He also founded the Municipal Gazette, the official organ of the Calcutta Corporation in 1924. C R Das believed in non-violent and constitutional methods for the realisation of our national independence. In the economic field, he stressed the need of constructive work in villages. He was a champion of national education in vernacular medium and felt that all the masses should be properly educated to participate in the nationalist movement. His religious and social outlook was liberal. A believer in women's emancipation, he supported the spread of female education and widow re-marriage. An advocate of inter-caste marriage, he gave his own daughters in marriage to Brahmin and Kayastha families. 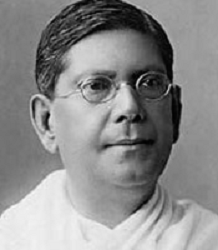 Deshbandhu Chitta Ranjan Das passed away on June 16, 1925 at Darjeeling at the age of 55. His body was brought down from Darjeeling to Calcutta by train, and a procession, over two miles long and consisting of more than 300,000 men and women with Mahatma Gandhi at their head, followed his body to the cremation ground. In is conception of self-Government he was ahead of his time and regarded it as freedom and well-being, not only for the privileged few, but for the toiling masses of India. The Central Avenue in Kolkata was renamed Chittaranjan Avenue (C.R. Avenue) after him. A few years before his death in 1925 he gifted his house and the adjoining lands to the Nation to be used for the betterment of the lives of women. Today it is a huge hospital called Chittaranjan Seva Sadan and today it has developed from a women's hospital into a very large Multi Specialities Hospital. Chittaranjan Park, a renowned enclave in New Delhi bears his name, as does Chittaranjan Bhavan, a hospital in Chittaranjan Park. The Indian Posts and Telegraphs Department honoured Deshbandhu Chittaranjan Das by bringing out a commemorative stamp on him on 5th November 1965, the occasion of his birth anniversary. Government of India also honoured Deshbandhu Chittaranjan Das by minting commemorative coins in 1998. Rabindranath Tagore paid this tribute to Deshbandhu Chittaranjan Das :"Man truly reveals himself through his gift and the best gift that Chittaranjan Das has left for his countrymen is not any particular political or social programme, but the creative force of a great aspiration that has taken a deathless form in the sacrifice which his life represented". To conclude in the words of Mahatma Gandhi, "Chittaranjan Das was one of the greatest men... one of the jewels among the servants of India. His service and his sacrifice were matchless. May their memory ever remain with us and may his example inspire us to noble efforts. C R Das was known as Kaliyuga Karna by the people in recognition of his donations for the cause of society. There are many anecdotes about his great personality. I wish somebody writes down all these before it is toolate!!!! hats off 2 c.r das. he truly was a national hero .